University of Delhi is among the highest ranked Universities in India. An organization of pre-eminence by itself, South Campus constitutes an integral and essential component of this educational organization of national importance. The small but beautiful campus boasts several state-of-the-art life science departments such as biochemistry, biophysics, genetics, microbiology and plant molecular biology which work with a great deal of synergy. The Department of Biochemistry, one of the most vibrant departments on campus and a premiere biochemistry department in the country, was established in the year 1983. It has appropriate space for M.Sc. educational programme as well as for research laboratories for various faculties. A two-year programme leads to the award of an M.Sc. degree in Biochemistry. Students are offered advanced level theory and practical courses in various classical and modern areas of biochemistry with utmost emphasis on hands-on-training. This includes rotation of second-year students in research laboratories to carry out short-term projects with different faculty members. Students are also required to present critical reviews of various topics in the form of elaborate seminars. Students also take two courses from other life sciences department on campus, which provides interdisciplinary flavor to the programme. Several quality improvement events like seminars by external experts, symposiums, poster presentations, scientific essay writing, science quiz, etc are regularly organized. In addition, numerous co-curricular events, including annual educational trips, are organized for wholesome development of students. The department trains 24 M.Sc. students at a time (intake 12 students), who are well absorbed immediately after by renowned Institutes in India and abroad. The Department enrolls students for Ph.D. degree from various disciplines through a competitive national level entrance examination. 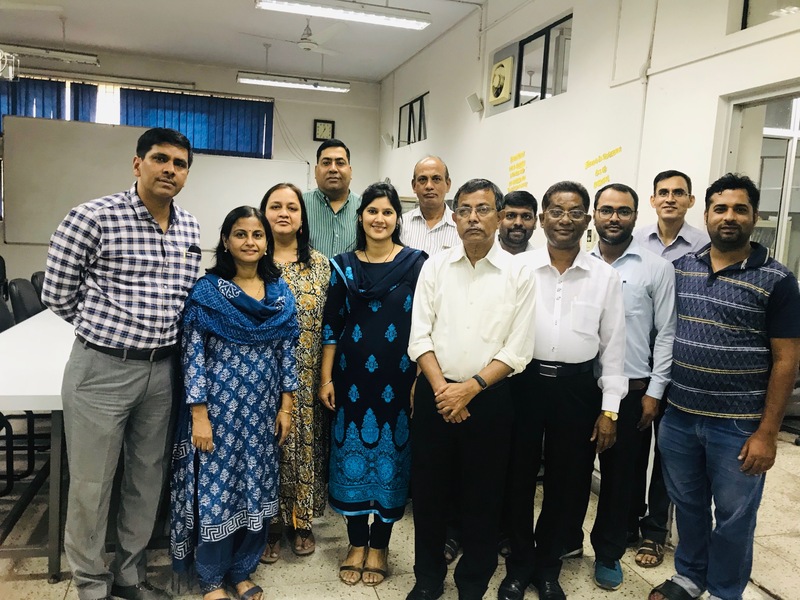 Students admitted in the Ph.D. programme undertake a course work as per UGC guidelines, which include a mandatory paper on Research Methodology. Ph.D. students in the department are offered high quality training and are encouraged to publish papers in peer-reviewed prestigious international journals, attend conferences and symposiums, present posters and actively participate in all departmental events. The faculties guide 30-35 Ph.D. students at any given time, who also do extremely well in their future endeavors. The Ph.D. programme of the department has been extremely successful with specialized focus on development of molecular strategies for understanding and combating human diseases. The emphasis has been both on basic and applied research. The M.Phil. course in Biotechnology (till 2017) was jointly run by the Departments of Biochemistry, Genetics, Microbiology and Biophysics wherein the students could opt for courses from any of the departments (currently most of the departments offer their individual M.Phil. courses). The M.Phil. courses allow students lateral entry into Ph.D. programme. The Department is well equipped with all modern and sophisticated scientific equipments and offers research opportunities in different areas of life sciences. The laboratories are well recognized nationally and internationally. In Department of Biochemistry, teaching over the years has reached impeccable standards and research attained world class quality. We have a world class faculty equipped with equally state-of-the art facilities that constantly churn out productivity – be it extremely well trained students, research publications that are well cited, patents or technology that have reached the market benefitting the common man (like diagnostic kits) or ones that have shown great potential for the near future (like vaccine, gene therapy, drug delivery, etc). In a small department like ours we boast of Bhatnagar awardees, Fellows of National Academies, GRC members and the numerous other success stories that are still being built. Our faculties have carved out a niche for themselves on the scientific arena. Several faculties have authored book chapters as well, are on several task force committees and are on-board editorial teams of international journals. The department has forged fruitful national and international collaborations over the years and has set up National Service Facilities (like DNA sequencing facility). Liposomal Amphotericin B - commercialized by Life Care Innovations, Gurgaon. Monoclonal antibodies to M13 phage protein - commercialized by M/s GE HealthCare (multinational) ($20,000 received for technology transfer). Detection of M. tuberculosis in culture - transferred to M/s SPAN Diagnostics Limited, Surat and is likely to be available in the market shortly as the product has received approval from Drug Controller General of India (Rs.20 lacs received for technology transfer). Virosome Technology for targeted delivery – transferred to Pancea Biotech. India, New Delhi (Rs.17.5 lacs received for technology transfer). Three of the vaccine regimens against Tuberculosis in principal have been approved for clinical trials by Tuberculosis vaccine clinical trials expert group of the Department of Biotechnology Govt. of India. The pre-clinical studies for humanization of these regimens are in progress. The department has also taken lead in whole genome sequencing of indigenous pathogens like Mycobacterium indicus pranii, which has opened up new horizon in understanding the evolution of pathogenesis in mycobacterial species and leprosy. It represented the first completed genome of a new species of bacteria published from India. Additionally, there are many leads in the area of vaccine and drug development, gene and drug delivery and diagnostics especially in relation to diseases like tuberculosis, malaria, jaundice/hepatitis, cancer and cardiovascular diseases. Many of the faculty members are working in close collaboration with industry or institutions, which are responsible for taking leads to the next level in the process of products development. Several research initiatives in mechanistic understanding of pathogenesis, host virus membrane fusion, liposomal and nanomaterial formulation, oncogenesis, amyloidosis and artificial blood substitutes and others are ongoing.